Whitney Foster is from Paragould, Arkansas. Whitney was a starting pitcher for her Varsity high school team for 4 years and received a full scholarship to play college softball. Before beginning her freshman year, she decided to sit out a semester and transfer to a Christian college in Arkansas where she would play volleyball and softball. At the end of her second year of college, Whitney was in an ATV accident that injured her ankle and ended her softball career. Whitney completed her degree in Secondary English Education at Arkansas State University. She taught high school English and Oral Communications and volunteered to assist with the pitching and catching staff at Paragould High School. Whitney is now completing her School Psychology Specialist degree at Arkansas State University. Whitney lives and offers lessons in Brookland, Arkansas. After my ATV wreck in my second year of college, I took a break from giving lessons altogether. When I started back, I told myself that if I was going to give lessons, then I was going to go about it like I would any other career. I was going to look for education and training opportunities to give my athletes the best possible chance at success and injury prevention. I had major setbacks in my softball career due to pain. Toward the end of my high school career and during my college career, I had learned to manage this pain through better mechanics and an intense stretching regimen, but it was still a constant battle. With this in mind, I began searching for answers to the best pitching mechanics. It didn’t take me long to find Tincher Pitching and Fluid Dynamics. I researched and read everything I could find on the internet about Tincher Pitching until I couldn’t find anything else about it. I reached out to Denny who then spent over two hours on the phone with me talking to me about instructor training and my background. After speaking with Denny and multiple instructors, I drove to Atlanta for my first training. I realized pretty quickly how much I had to learn and left feeling overwhelmed and so excited to get started. The more I learn, the more I come to see this as an organization where the members are always looking for better ways of learning and teaching. The overall attitude of everyone wanting to learn from everyone else is a humbling experience. The instructors lean on each other for advice and guidance and build on each other’s strengths. Because of this, this organization helps girls pitch pain free while performing better. 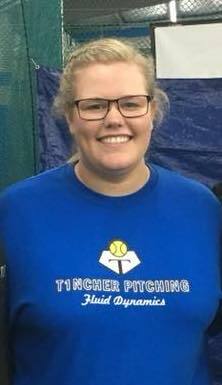 Completing my Tincher Pitching certification is easily the best decision I have made for myself and my athletes. Here is what Denny says about Whitney: From the very first time you meet Whitney, it is obvious she is sincere, caring, and dedicated to the success of her students. She is the right combination of being patient, yet demanding. She speaks softly, but conveys high expectations. The kids just love her and we love having her on board.